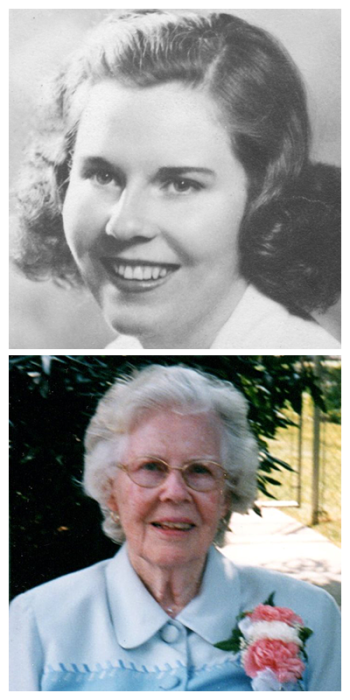 Obituary for Virginia M. (Hanrahan) Gettler | Wyman-Fisher Funeral Home Inc.
Virginia Marian Gettler, 96, passed away on Sunday, March 24, 2019. Virginia was born on July 31, 1922 to Ethel Stuart Hanrahan and Edward A. Hanrahan. She grew up on Read Avenue in the Crestwood section of Yonkers, NY with her younger sister, Dorothy, born in 1924. Virginia attended Yonkers Public Schools and then Ursuline High School, where her intellectual abilities shined leading her to a full scholarship at The College of New Rochelle where she obtained a BS in Chemistry. After graduation, working as a research chemist at American Cyanamid in Stamford CT, Virginia realized she needed more education in order to succeed in her chosen career. With an intense love of learning and a resilient desire to succeed, she returned to school at Columbia University in 1945 to pursue her masters and PhD in chemistry. During this time women were not permitted to work in the science laboratories during the day, and were forced to perform their research at night. Virginia did not let this deter her from working toward and achieving her goals. She was ahead of her time. While studying at Columbia University, Virginia met her future husband, Joseph D. Gettler, who was also a PhD candidate in Chemistry. After they obtained their doctorates and secured jobs, they got engaged and began their life together. On January 22, 1955 they were married at Annunciation Church in Yonkers, NY and settled in Riverdale, NY to start their family. In 1961 they purchased a home at 209 Jennifer Lane, Yonkers, NY where they raised their four children – Paul, James, Alexander and Dorothy - and where Virginia lived for almost 50 years. Dedicated to her family and her faith, Virginia became a stay-at-home mother caring for her four children and her elderly father until his death in 1978 at the age of 93. Virginia was an avid volunteer for St. Eugene’s Church and School where all four of her children attended. Whether she was a Girl Scout Leader, Cub Scout Den Mother or coordinating a reading program for 5th grade students, she was dedicated to helping the community and its children. She was also an avid pet lover taking in stray cats and dogs over the years, providing comfort and love to them all. Once her children were older and more independent Virginia began her second career and returned to her first loves, math and science, taking a teaching position at St. Casimir’s School in Yonkers, NY. As a math and science teacher for 6th, 7th and 8th grade students she touched the lives of hundreds of children during their formative years, sharing her love of learning. Virginia retired in 1990 to care for her husband, Joseph, during his stoic battle against cancer which he succumbed to on May 18, 1991. Later in life Virginia had many interests including her love of reading, taking walks, caring for her precious pets, traveling and most especially spending time with her children and grandchildren, who were the joy of her life. She remained an avid parishioner at St. Eugene’s Church in Yonkers until her health required her to move into Assisted Living in 2009. Virginia was predeceased by her parents, sister and husband. She is survived by her four children Paul Gettler; James Gettler (Janet); Alexander Gettler (Mary Elizabeth) and Dorothy Gettler Atzl (Bill) as well as her seven grandchildren: Alex, Vicky, Dan, Billy, Kerry, Kristine and Patrick. Virginia will be remembered as a loving and devoted daughter, sister, wife and mother, dedicated to her family throughout her entire life. She was a quiet, reserved person with an inner strength and strong faith in God who will be missed but remembered lovingly. She is now at peace with her husband, parents and sister. A Mass of Christian burial will be celebrated 10:00 am Thursday at St. Aedan R. C. Church, Pearl River. Burial will follow at Gate of Heaven Cemetery, Valhalla, NY. Visiting is Wednesday from 4:00 to 8:00 PM at Wyman-Fisher Funeral Home Inc. In lieu of flowers, donations to the American Cancer Society are appreciated.